The CT & CS Certification Programme is a professional development program produced by the Malaysia Digital Economy Corporation (MDEC). It’s designed to build teacher competency in computational thinking (CT) through coding, with an emphasis on integrating the principles of CT throughout the school curriculum. The program has two main components: a five-day face-to-face course and a certification component offered in conjunction with Computing at School (a professional community in the UK) and sanctioned by the British Computing Society. Certification is offered to teachers who, after completing the five-day course, develop and submit a working computer program and conduct a classroom investigation to evaluate aspects of the pedagogy presented in the course.The computer program that must be developed for certification is intended to demonstrate the author’s technical ability, while also creating something that can be applied in an authentic classroom situation. Five-day face-to-face course for educators. Course content focused on computational thinking and computer science. Additional certification component available through a final project. 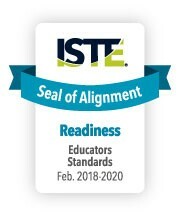 The Computational Thinking and Computer Science Teaching (CT & CS) Certification Programme successfully underwent the International Society for Technology in Education (ISTE) Seal of Alignment review for Readiness. Reviewers determined this resource helps build foundational technology skills needed to support the ISTE Standards for Educators. The CT & CS Certification Programme contains features and components that collectively contribute to laying a foundation of basic technology skills that enhance awareness of technology applications. This resource helps build foundational technology skills needed to support the ISTE Standards for Educators.